This project signified early federal involvement in the construction of airports. Because of the Great Depression, the federal government helped cash-strapped cities improve their airports. Federal involvement helped the unemployed, but it also kept airports up-to-date in case the military needed them. This need would arise in World War II, when the military commandeered airports, including the Shushan Airport. 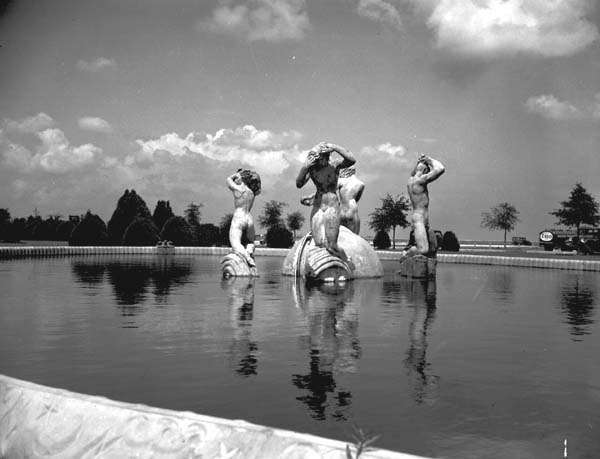 Despite the stunningly attractive airport, by 1939 Louisiana and federal government officials could no longer ignore the rampant embezzlement of government money, including WPA funds. 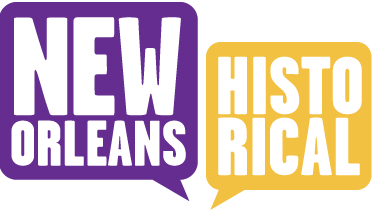 Coming to light in “the Scandals” were examples of, Shushan and the Orleans Levee Board inflating the savings collected from the bonds sold for the lakefront project in order to give themselves a significant amount of money. Shushan and other officials were indicted and convicted of tax evasion and fraud. Shushan went to prison, and though President Truman pardoned him, the damage was done. 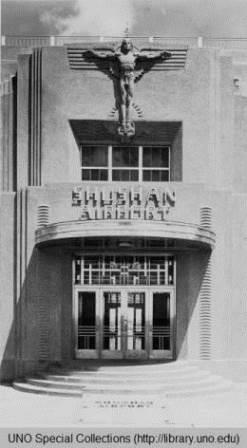 The Shushan Airport was renamed the New Orleans Municipal Airport. For the final part of the tour, walk toward the hangar across the street and face the administration building. 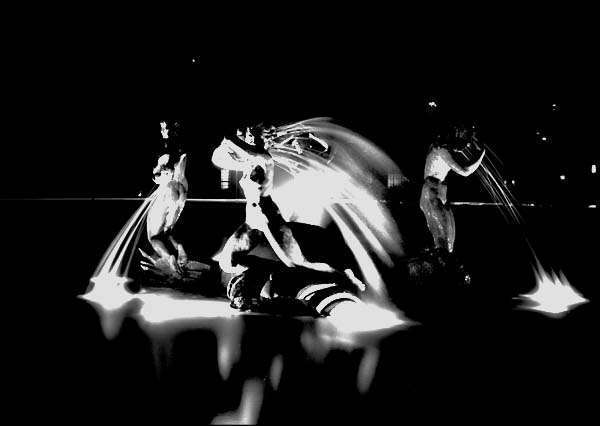 "WPA installed the marine lighting for the "Fountain of the Winds," New Orleans Airport. [View of the fountain at night.]" ~ Date: July 9, 1938. "Vari-colored lighted fountain at New Orleans Airport (daylight exposure). 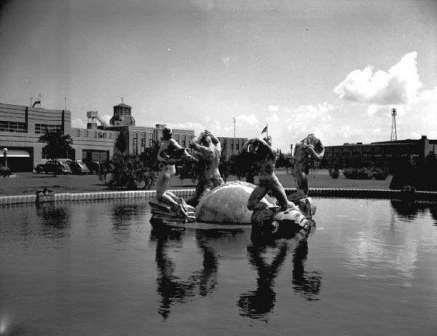 Fountain of the Winds, constructed by the WPA as a part of a general beautification program at the airport." ~ Date: July 8, 1938. 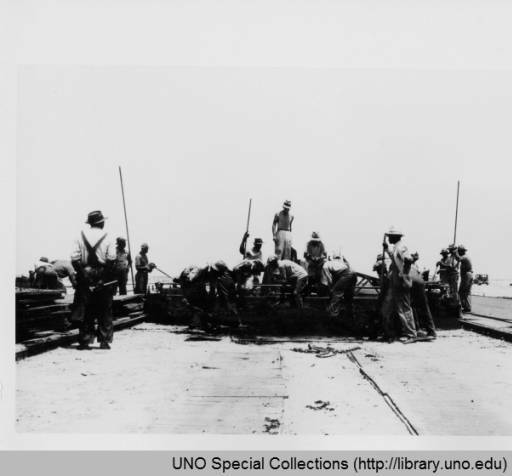 Teresa Thessen, “The Works Progress Administration Renovations and the Fall of Abe Shushan,” New Orleans Historical, accessed April 19, 2019, https://neworleanshistorical.org/items/show/607. Janna Eggebeen, Airport Age: Architecture and Modernity in America, Ph.D. Dissertation, The City University of New York, 2007. George W. Healy, Jr. A Lifetime on a Deadline: Self-Portrait of a Southern Journalist, Gretna: Pelican Publishing, 1976. Alan Brinkley, Voices of Protest: Huey Long, Father Coughlin, and the Great Depression, New York: Alfred A. Knopf, 1982. Funding for technical support provided by anonymous donors in memory of the Samuelson, Wolfson, and Fertel families.